This has been a crazy summer. July was one of the coldest and wettest in history here in New England, and I don't think I was even once was able to fish a river. Well, maybe once. But generally water levels were what they normally are in May, right after spring runoff. That left me fishing ponds from my hobbie float cat. But even that has been something I have avoided for about two weeks due to the oppressive August humidity and high temperatures. Well, I finally got out on Sunday and the fishing was fantastic. Humidity was down a bit, temperatures were below 90F, and there was enough of a ground level breeze to keep me happy. 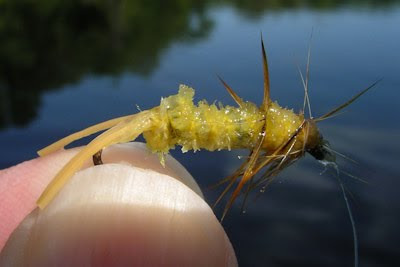 The closest thing I had to the yellow jackets that were swarming the lily pads and were getting sucked in by the bluegills was a single Brooks-style yellow stonefly nymph which I tied with rubber band strands for a tail. Lots of action! It was unweighted and I fished it right along the edge of the lily pads with great success until I lost it after one vicious strike which could only have been a pickerel. 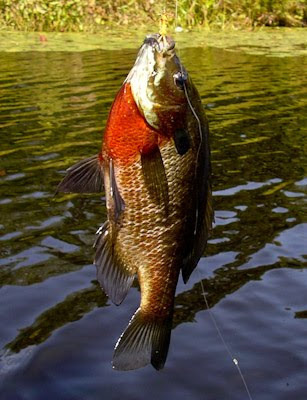 The reward was bluegills (males) in spawning colors. On the other hand, one photo here is of a male (yes?) in post-spawn lack-of-color. 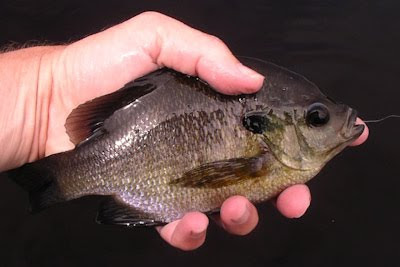 It was the greyist colored bluegill I had ever seen, and I thought a picture would provide an interesting contrast to the bright-colored spawning males. After loosing that one-and-only yellow stonefly nymph I switched to the only other yellow fly I had with me. This is my own little version of a Dark Edson Tiger. 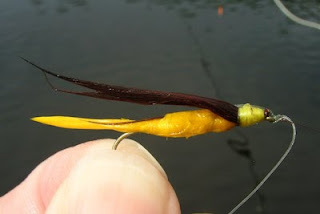 (Mr. Edson named his fly after the "dark" wing and not the "light" body; the Light Edson Tiger is tied with a yellow wing and peacock herl wrapped body.) 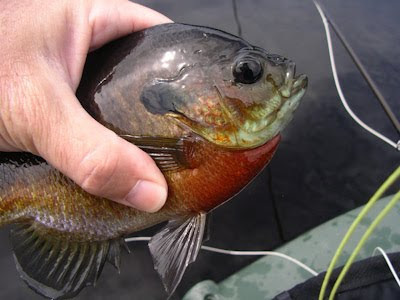 The bluegills slammed it and typically this meant removing the streamer with foreceps, whereas when I had fished the nymph it was usually dangling from the upper lip. 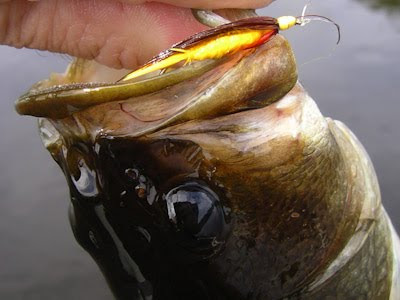 A couple of bass fell for it too.